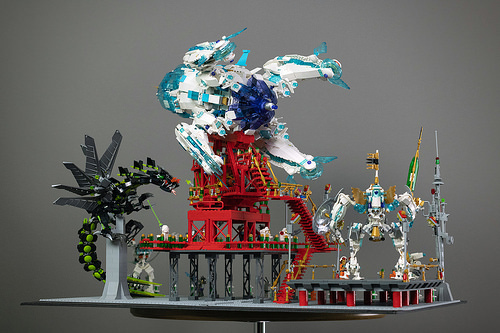 Last year LEGO model builder Moto debuted his dazzling Chrysalis spaceship, and recently at Denver Comic-Con he enhanced his original creation with a space dragon attack on a remote space base with space heroes on the defensive. In the builder’s own words- “While performing standard maintenance, the Redstone 5 launchpad has come under attack from the Blacktron Dragon Obscurtronum!” and you can see the brave efforts the base occupants are making to guard against the assault. 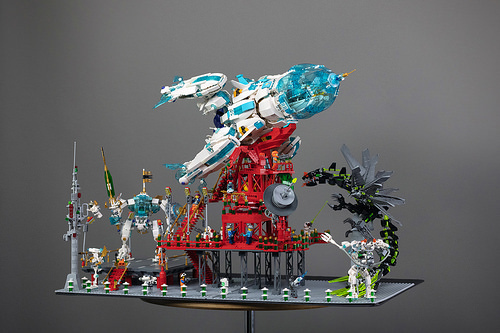 The star of the show here is still undoubtedly the Chrysalis ship, which shines on the screen even better now with a contrasting background element and the bustle of the battle scene. Thank you for the article. It blew my mind to see my own build while checking in today. Odd opinion, perhaps, but for me the best part is the scaffolds and gantries! Thank you Felicia! I wanted to give the platform the look from the US Apollo program – red and exposed studs.